Jerome John "Jerry" Garcia was an American musician best known for his lead guitar work, singing and songwriting with the band the Grateful Dead, which came to prominence during the counterculture era in the 1960s.Though he disavowed the role, Garcia was viewed by many as the leader or "spokesman" of the group. 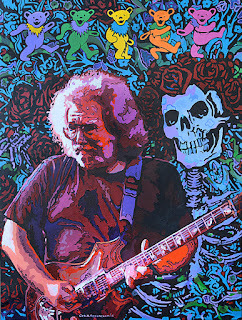 One of its founders, Garcia performed with the Grateful Dead for their entire thirty-year career. 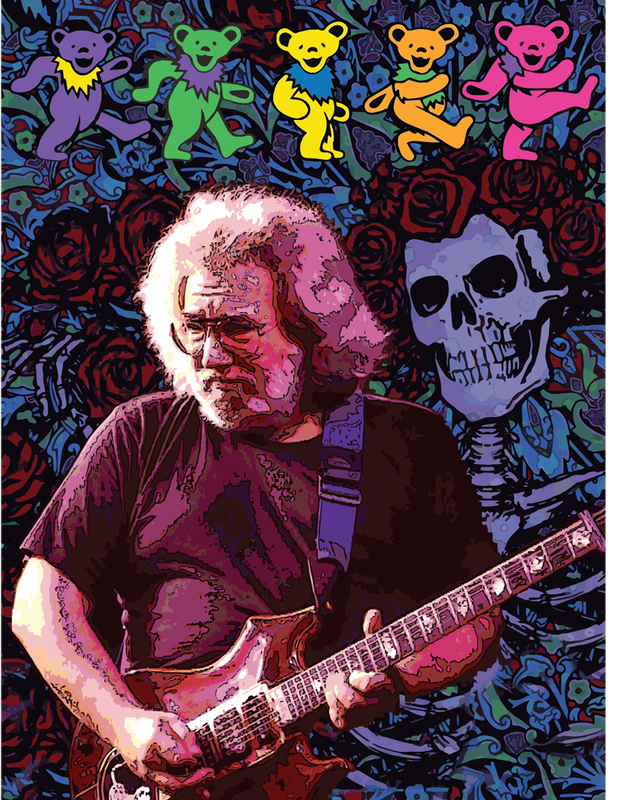 Garcia also founded and participated in a variety of side projects, including the Saunders–Garcia Band , the Jerry Garcia Band, Old and in the Way, the Garcia/Grisman acoustic duo, Legion of Mary, and the New Riders of the Purple Sage. over the years as a session musician. He was well known for his distinctive guitar playing and was ranked 13th in Rolling Stone's “100 Greatest Guitarists of All Time” cover story. Having previously studied at the San Francisco Art Institute as a teenager, Garcia embarked on a second career in the visual arts in the late 1980s. He offered for sale and auction to the public a number of illustrations, lithographs, and water colors. Some of those pieces became the basis of a line of men's neckties characterized by bright colors and abstract patterns. Years after Garcia's death, new styles and designs continue to be produced and sold. Numerous music festivals across the United States and Uxbridge, Middlesex, UK hold annual events in memory of Jerry Garcia. 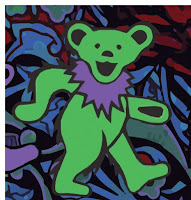 the back cover of History of the Grateful Dead, Volume 1, artist Bob Thomas took his inspiration from a 36-point lead slug of a happy-looking bear he found in an old-fashioned printer’s font box. 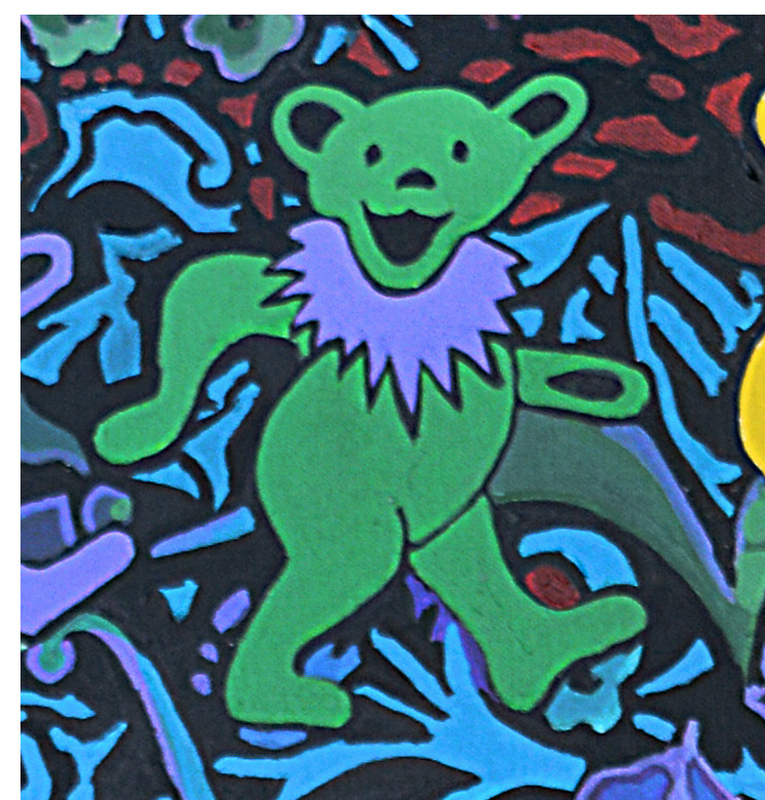 Since the Grateful Dead bear's first debut on the album cover in 1970, the bear has found its way onto t-shirts, mugs, hats, ties, plush toys, and more. The generic design has been used as the basis for several commercial logos over the years. One of the best known was Bear Wheel Alignment, whose logo is almost an exact duplicate of the type-character. 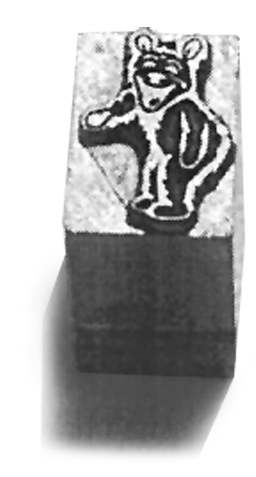 Bob made significant changes to the basic design when he derived it for the album. 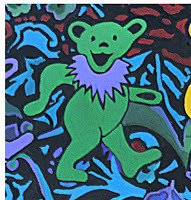 his artwork on an uncredited photo of Jerry Garcia, and iconic “deadhead” cover art (including the marching bears). The original art was on designed on the computer by adapting existing lo-res images to produce vector art that could be produced in any size without degradation. The final image produced appears much like a paper cutting, with crisp edges and flat even color and can be produced to wall size if necessary. In addition to George's graphic abilities, he is also a painter, and his family has convinced him that in addition to merely offering acrylic and metal prints of the original graphic art, that he “paint” some of the images in acrylic on canvas. This task is tedious and offers a different “scribbier” element to the artwork. 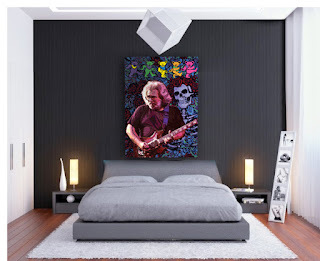 At this time, George has painted Alice Cooper and Jerry Garcia on 40" x 30" canvases. These paintings must sell for a lot more than the “perfect prints” produced from the original art. The “canvas” art is priced at $4500 plus shipping and any tax. Paper giclée prints produced on 22" x 17" archival paper are also available of the painting (for people who are purists and believe in hand work). To purchase a painted print or the original, scroll down to the “Add to Cart” button at the bottom right.